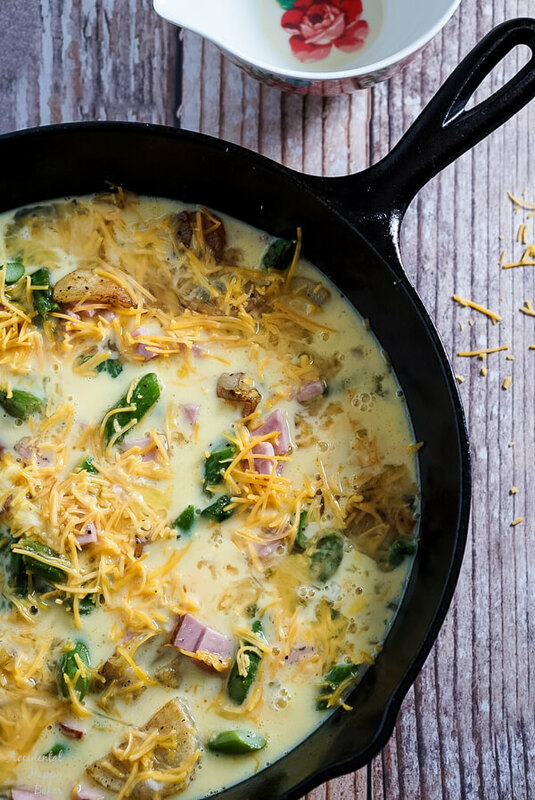 Creamy eggs, tender asparagus, ham, potatoes and cheese make a hearty breakfast dish that comes together in less than 30 minutes. 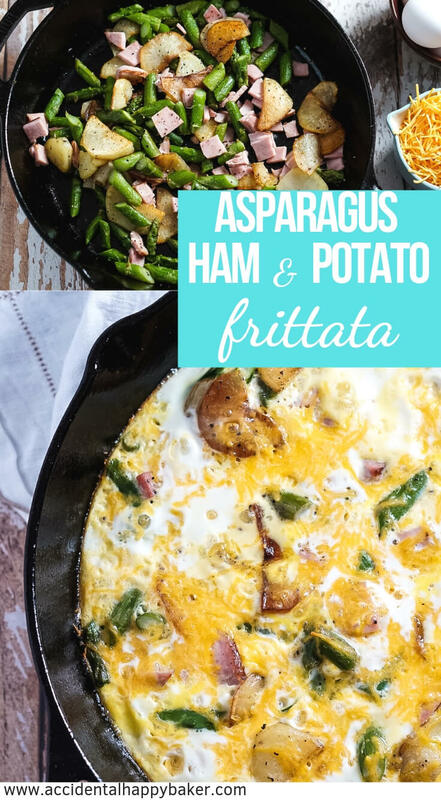 This ham, asparagus, and potato frittata might sound fancy, but really I just had some odds and ends in my fridge that needed used up! And that, my friends, is the beauty of the frittata. You can have a few odds and ends and actually come up with something delicious that will feed your whole family. Sidenote: We’ll call this a breakfast dish, because technically it is. But I have never in my life made a frittata for breakfast. Frittatas are my last minute whoops I forgot to go grocery shopping and I need something on the table for dinner now dish. 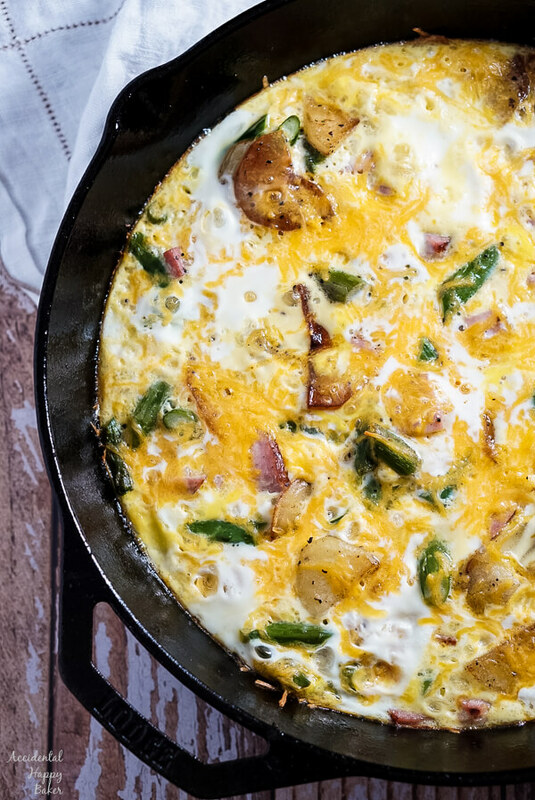 To make a traditional baked frittata you will need an oven safe skillet. A frittata is simply an oven baked omelette, but usually the fillings are cooked partially or completely before the eggs are added. I always use my cast iron skillet for frittatas because one dish meal? Gotta love it! However, if you don’t have an oven safe skillet you can work around this by cooking your ingredients in a skillet and then transferring them to an 9 x 9 oven safe pan to bake with the eggs. Or even bake it as mini frittatas in a muffin tin! There are so many options when it comes to frittatas. 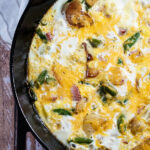 You can use fresh or frozen asparagus in this frittata. Check here for tips on buying and preparing fresh asparagus. If you are using frozen asparagus, simply thaw it out, chop it up, and add it at the same time you would add the fresh asparagus in the recipe. This recipe was originally posted on March 19, 2015, but was updated with new photos and tips. 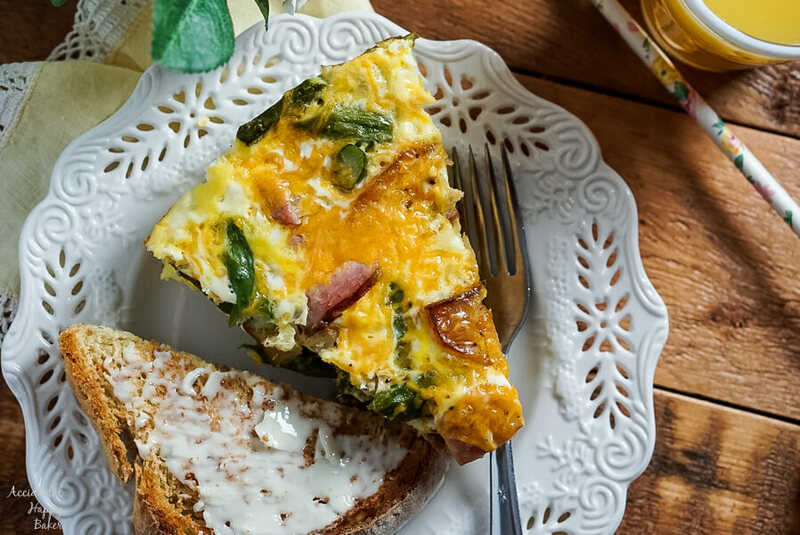 This Asparagus, Ham, and Potato Frittata is quick and easy dish, perfect for any time of day. In a cast iron, or oven proof skillet, heat the olive oil over medium heat. Add the potatoes and fry them in the hot oil until they begin to brown on one side. Flip them over and add the asparagus and continue cooking another 5 minutes. Add the ham and generously season with salt and pepper. In a mixing bowl beat together the eggs and milk. Sprinkle the colby jack over the vegetable mixture. Pour in your eggs, making sure that they are evenly distributed throughout the pan. Bake on the middle rack of the oven for 20-25 minutes. Breakfast for dinner? You bet! Here are a few more recipes that can do double duty. Spicy and smoky chipotles bring the flavor in this veggie loaded Southwestern Chipotle Quiche. Full of roasted corn, black beans, green onions, cheddar and a hashbrown potato crust. These Holey Huevos are a Mexican version of eggs in a basket. 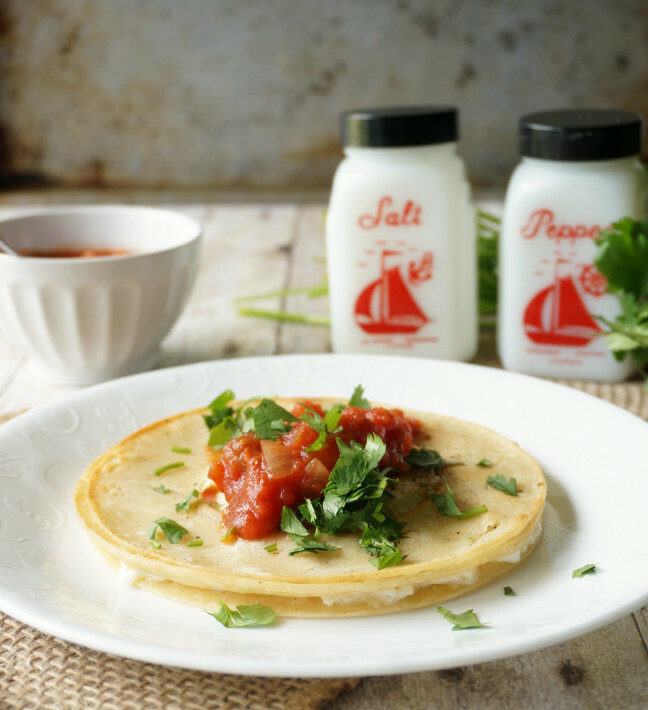 Crispy corn tortilla surrounds a fried egg that’s topped with cilantro and salsa. Missed this when you first published it. 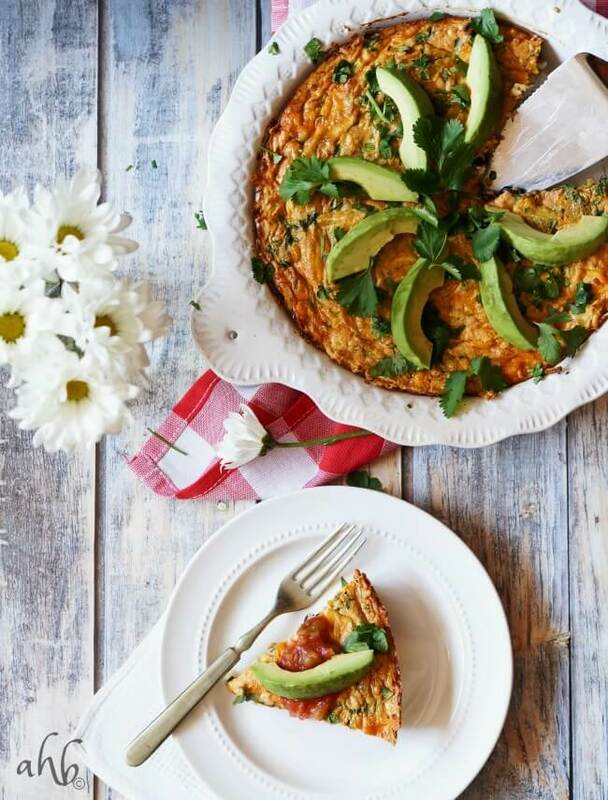 I don’t know that I have ever had a frittata but this looks really good! I also am not a morning person unless morning doesn’t start until 10. You are missing out, Kathie! Frittatas are so easy and yummy. I used to be not be a cast iron cookware person. Didn’t want to mess with them. Frittatas and Yorkshire pudding were the dishes that won me over to the dark side and now I am a total convert. I have just recently started doing asparagus, I feel it is a hard one to get cooked just right. Is it really soggy in this recipe? Well now, I guess that depends on your definition of soggy. It’s not crisp asparagus by the time it’s cooked, but it’s not floppy, slimy, stuff either. If you like a crisper asparagus, you can always lessen the time that it cooks before the eggs are added and it goes in the oven. Thanks so much Evi. I’m glad that you stopped by and hope that you enjoy it. I’ve had that issue too Nancy, and it’s not fun. Crispy brown bottomed eggs are not appetizing. My answer to combating this problem is making sure that I have enough filling, veggies and meat, to cover the largest portion of the bottom of the pan. That way there is less egg resting on the bottom to brown. You got me – lol! You know, I hadn’t really thought about asparagus being something you could put in a breakfast food either, because my usual go to for asparagus is plain ol steamed and topped with butter served beside a t-bone steak. (My favorite and usually my birthday dinner every year.) But it so works together. If you try it, let me know how you like it! Yum! I’ve never tried potatoes in a fritata, but I’m going to now. That looks delish! It’s kinda like getting your hashbrowns thrown in for free! Thanks for stopping by and taking the time to comment Kara. I appreciate it. I’m trying to eat healthier, so deffo need to try this out. I can’t remember whether or not I like asparagus, can you recommend any alternatives? Absolutely Louise. 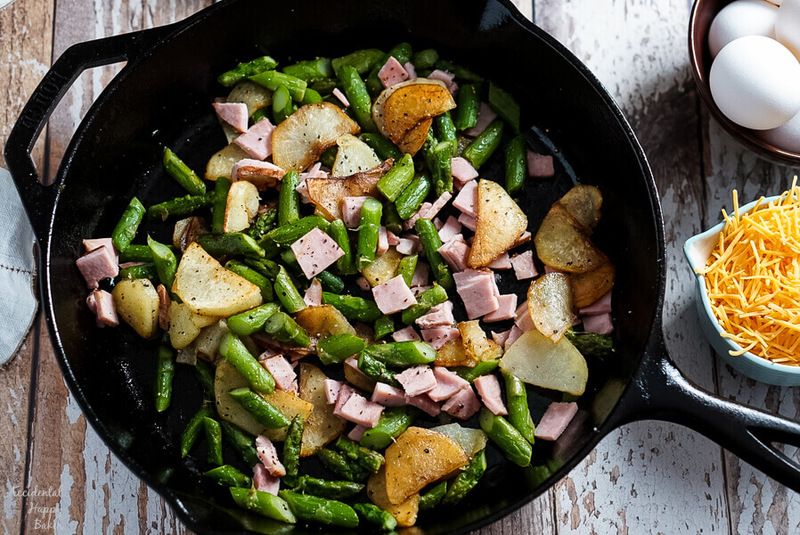 My personal first choice as a substitute for the asparagus would be spinach because it also goes really nicely with the ham, potatoes and eggs, but other veggies that you could use would be fresh green beans, broccoli chopped smaller so that it would cook through, zucchini, or snap peas. Mmmm- that looks so delicious! And for the record I think that last photo especially is great! Have fun with the new camera! Thank you, Valerie. The photography has definitely been one of the hardest things for me so far, but I’d like to think that it’s been improving slowly as I get more comfortable with it. So it’s really nice to hear someone say that the photos look good! I’ve never tried cooking with asparagus, but I want to try this! If you’ve never cooked with asparagus this would be an excellent introduction. It is very simple and the flavors of this just scream spring. I love cooking something that mirrors my mood and this mood is–bring on the bright colors of the daffodils and the tulips! And yeah- breakfast is cereal around here- or a bagel. Mama likes to sleep. I am totally gonna give this recipe a whirl. It looks delicious!!! Oh, and we will be eating it for dinner. Ahem. Haha. One time I really did run into an old flame from high school at the grocery store. It was WAY awkward. 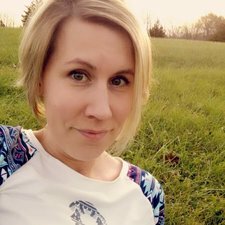 I, thankfully, was wearing a cute sundress and had my hair and makeup done. He’d gained a lot of weight, had lost all his hair, and was wearing pajama pants while buying an enormous bag of kitty litter. Life is strange. Anyway, I hope that you enjoy this recipe! LOL I am actually dying laughing over this right now! Good!I hope that you are laughing because it’s actually funny, not because you know me and can totally imagine me clutzing it up all morning! Sounds yummy! I’ll have to try this once my asparagus pops up out of the ground this year! Ah man! I’m jealous. I’d love to grown my own. I just don’t seem to have the best of luck growing food. Flowers, yes. Fruits and vegetables I just can’t seem to do.